Michael Douglas! Channing Tatum! Michael Fassbender! Antonio Banderas! Ewan McGregor! These men plus a newcomer, MMA fighter Gina Carano, make up the A-list cast of Haywire. Its trailer makes the movie seem like it will be a fast-paced secret-agent movie, but instead it's rather slow and reflective in parts; however, the fight scenes, mostly due to Carano, are great, and that is where this movie excels. Mallory (Gina Carano, Blood and Bone) is an agent who works for a private company that is contracted by the government. She's just returned from her last job in Barcelona when her handler, Kenneth (Ewan McGregor, Beginners), asks her to take a "cake job" in Dublin, where her cover will be that she's married to Paul (Michael Fassbender, Shame). Mallory and Paul will need to extract a journalist to get him home safely. She and Paul attend a party at a castle-like home in Dublin, and when they get back to their hotel room, things go awry; she soon realizes that she's been set up, and she needs to get out of Ireland ASAP. She can't trust her handler anymore so she calls Coblenz (Michael Douglas, Wall Street: Money Never Sleeps), the government agent who hired her company, and explains the situation to him. Mallory must find her way back to the U.S. safely on her own since she is now being labeled as a "rogue agent," and Kenneth will stop at nothing to find her. Since Gina Carano is an MMA fighter, the fight scenes in this film were top notch. 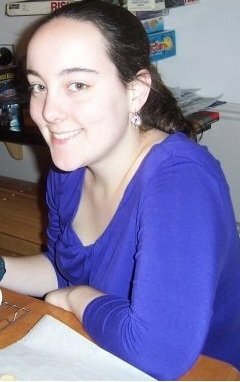 The very beginning of the film will get your attention when one of her former colleagues, Aaron (Channing Tatum, The Eagle), tracks her to a diner where she is having breakfast and proceeds to throw a cup of coffee in her face. However, the points between the fight scenes tended to lag a bit; other screening moviegoers complained that the plot was "weak," though I disagree with that - Carano's character is a smart woman, and so much of the dialogue and twists were interesting. Yes, see this film, though be aware it doesn't have my "strongest" recommendation. The film could have been better but parts of it were very good, including how it opens in the present and then we are brought back in time via flashbacks to see how Mallory ended up in her current situation. Her father (Bill Paxton, TV's Big Love), too, knows exactly what line of work she is in, and doesn't hesitate to offer her shelter when he finds out that she's running from the "bad guys." 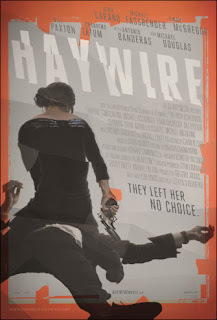 Haywire is more of a "thinking" movie than pure action like the recent Contraband, and although it comes up short in some areas, it makes up for those in other aspects of the film. Haywire is in theaters today, January 20th, and is rated R with a runtime of 93 minutes. 3 stars out of 5.